For those of you who did any research into friends1st before you joined (you did do that didn’t you?!) you’ll probably be aware that I have been writing newsletters, blogs and archives for our members for a long time (well like 17 years now!). I guess a large part of that writing is aimed at persuading members to look less critically, judgmentally and specifically at other members. “Here she goes again” I can hear you thinking! You may well ask and if you’ve thought either of these two things I’m happy because at least you’ve been reading some of my stuff – even if you haven’t taken it all on board yet (or maybe you have – in which case well done). Now thankfully not all our members experience membership like this but certainly some do. My writing is always to try and prevent people from having a so called ‘bad experience’ of membership (which invariable and almost always means they haven’t met the right person they’d hoped to meet). Over the 17 years I guess I’ve always struggled to completely pin point what the real issue is. Yes judging profiles, distance and your critical list comes into it… but there’s’ something much more and it’s very hard to pin point. Or was…. until recently when I joined my husband at church in the village we were visiting in Ireland. To my surprise, this particular Catholic church was as lively and alive as any Anglican church I’d been to in the last 10 years. The gospel message was well preached and ran through the whole service. The two priests were clearly devout Christians – the children’s programme was alive and kicking and the people devout in a lovely down to earth way. The priest preached powerfully on turning the other cheek, what it means to show love as Christians and it was a challenging message. And in that one phrase I suddenly realised what I’ve been trying to get across to members for 17 years. 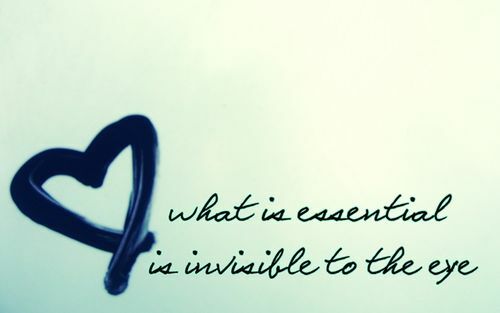 The essential is invisible. In our context then, what you are truly looking for in someone else – in your ideal, perfect partner – is invisible. That’s why you can’t’ read it in a profile. It’ll never be there because it’s invisible! You can only really understand how true this principle is when it’s happened to you. You see we all think we want x, y and z. In my case it was a to meet a sporty, active man of my own age – or thereabouts – of good means who was a keen Christian and single like me. Most of that stuff I could have seen if I’d been looking at profiles like we send out from friends1st. What I could never have seen is a man who is kind, generous, unbelievable good company, well mannered, polite, gracious and a whole host of things I am honored to have found in a husband. Needless to say, he’s very little of what I thought I wanted, as any member who I’ve spoken to about him will know! Most recently I’ve been struck by his kindness (and I’m not just talking about generosity – though he’s generous too!). He’s a fundamentally kind person – which is one of the most wonderful traits to find in a partner/soul mate. But until I got to know him -and even got to know him very very well – we’ve been 12 years getting to know each other now- I couldn’t have visibly seen this trait. Why? Because the essential is invisible! So here’s my advice to you. Write that phrase down (the essential is invisible) and put it somewhere where you’ll be forced to read it next time you receive a set of profiles from us, or are reading back over profiles you’ve received in the past. Remember when you read each profile “The Essential Is Invisible” and then ask yourself are you looking for the essential or just the superficial? It may just change how you react to the peoples details we send you…. and this could change the rest of your life!